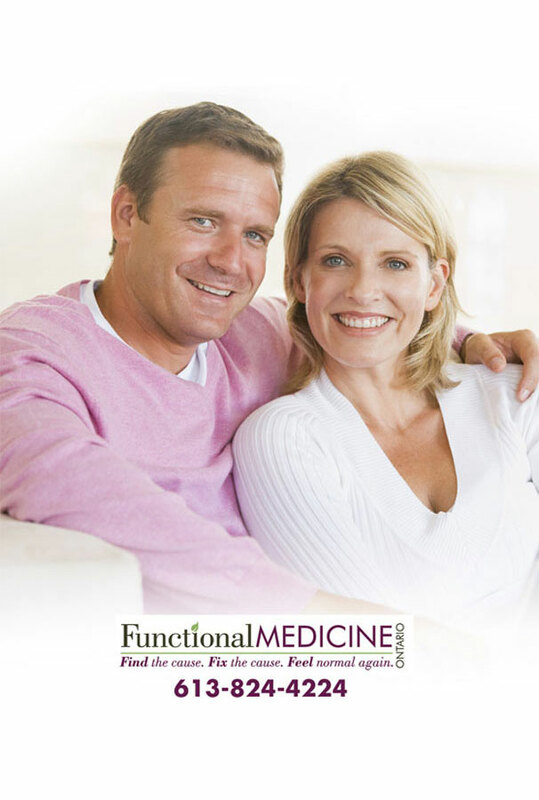 In this episode of The Functional Medicine Radio Show, Dr. Carri’s special guest Dr. Dale Bredesen talks about Alzheimer’s prevention and treatment. Dr. Dale Bredesen received his undergraduate degree from Caltech and his medical degree from Duke. He served as Resident and Chief Resident in Neurology at UCSF, then was postdoctoral fellow in the laboratory of Nobel laureate Prof. Stanley Prusiner. 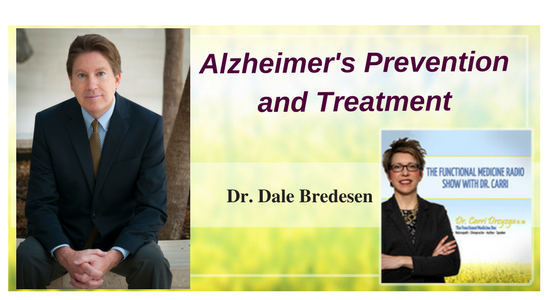 Dr. Bredesen was the Founding President and CEO of the Buck Institute for Research on Aging, and is the Director of the Easton Center for Alzheimer’s Disease Research at UCLA. His group has developed a new approach to the treatment of Alzheimer’s disease, and this approach has led to the discovery of subtypes of Alzheimer’s disease, followed by the first description of reversal of symptoms in patients with mild cognitive impairment and early Alzheimer’s disease, with the ReCODE (Reversal of Cognitive Decline) protocol. His book, The End of Alzheimer’s, is a New York Times Bestseller. What can be done for people that have memory impairment, cognitive decline, dementia, or early Alzheimer’s? Can you talk about infections and how they can have such a big impact on our brain health? 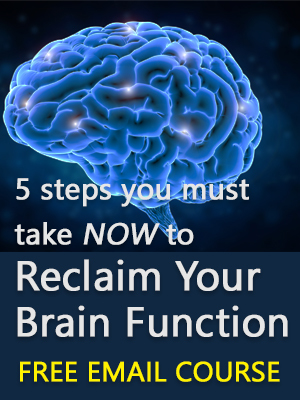 How do hormones, toxins, and inflammation contribute to brain decline? When should we start onto treatment? How early should a person start working towards preventing cognitive decline? Can you talk about one or two patients that you’ve worked with and where they were and how they’re doing now? How fast should a patient start to feel better on your program? What are the next steps to take for those who need help? 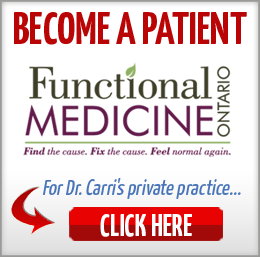 How do we find a doctor or practitioner that’s been trained under you? Dementia is now the third leading cause of death in the United States, and the number one cause of death in the United Kingdom. The reality is we can now do something about Alzheimer’s prevention. In fact, if we all do the right things, we can actually reduce the global burden of dementia dramatically. We have spent the last 30 years in the laboratory looking at the underlying mechanisms that drive the disease. When you go in to a physician and you have cognitive decline, the physician does not evaluate why you have it. They might do your serum sodium and serum potassium and maybe some thyroid tests, but they don’t look at the many different factors that actually contribute to it. There are dozens and dozens of different contributors to Alzheimer’s, including: chronic inflammation, Lyme disease, infections including oral bacteria, leaky gut, too many trans fats, too much sugar, low estradiol, low testosterone, low thyroid hormones. We evaluate you to determine what are the contributors to your cognitive decline or your risk for cognitive decline, and then we can address all those things appropriately. Alzheimer’s disease fundamentally is a protective response to these different agents, like chronic infections (bacteria, spirochetes, viruses, molds, fungus), inflammation, heavy metals, and toxins. The downside to this is you are fundamentally downsizing your brain, too. What’s now been shown in the brains of patients with Alzheimer’s is some will have Lyme disease, some will have specific viruses, such as herpes; some will have oral bacterial such as gingivalis; some will have various fungi, such as Candida. There are all sorts of different pathogens that, in fact, can get into your brain and your body then makes beta amyloid plaque to fight the infection. Alzheimer’s is like a roof with 36+ holes in it. Of course for each person, the holes are a different size. If you are extremely low on your vitamin D, that hole in your roof is large. If you’re very good with your vitamin D, and I don’t just mean within normal limits, I mean optimal, then that hole is closed, and so forth and so on down each of the different 36. If you’ve got Lyme disease, then that hole is opened and you’ve got to fix that one. You want to address as many of these holes as you can. That’s when you begin to see these dramatic improvements in people. Everybody should do either Alzheimer’s prevention or early reversal of cognitive decline. Phase One = you’re asymptomatic. That’s the time to jump on things. You want to do prevention. This is where Alzheimer’s prevention has the best outcomes. Phase Two = SCI, or Subjective Cognitive Impairment. That’s when you know something’s wrong but your cognitive tests are still normal. Things are brewing. You should definitely start working on Alzheimer’s prevention. Phase Three = MCI, Mild Cognitive Impairment. Now the cognitive tests are also showing that there’s something wrong, but you’re still able to take care of yourself. Your activities of daily living are fine. It’s not too late yet to start Alzheimer’s prevention. If you don’t do anything about the earlier phases then you reach Phase Four = full blown Alzheimer’s disease. That’s where you begin to lose your activities of daily living. It’s too late for Alzheimer’s prevention. Key for Alzheimer’s prevention: Everybody who’s over 45 should get a cognoscopy – a series of blood tests and cognitive tests to see where you stand with your brain health and you can begin treatment for prevention or, at the latest, early reversal. There is a tremendous amount that can be done. There’s a whole website, for example, ApoE4.info, that deals with people who are at high-risk for Alzheimer’s because of a specific gene, ApoE4. An easy way to get the ApoE4 test is through 23 & Me. If you have zero copies of the ApoE4 gene your lifelong chance of developing Alzheimer’s is about nine percent. If you have one copy of ApoE4 it’s about 30 percent. If you have two copies it’s over 50 percent, so most likely you will develop it over your lifetime. This is why early treatment and Alzheimer’s prevention are so critical. Saying a person has Alzheimer’s doesn’t tell you what causes it – that’s why assessment by a properly trained doctor to find the root causes is so critical. The typical person we see who has cognitive decline has between 10-25 different contributors to the cognitive decline. We want to address as many of them as possible. We’ve published in the land of over 220 papers, but just on the clinical approach here, just four. We’re now actually writing the next one on the next 50 people who showed objective improvements. This is now from physicians we’ve trained from 10 different countries, including Canada, so we’re very excited. The most important thing of all here is that people who show improvement show sustained improvement as long as they stick to their program. Now, not everybody improves. Many people do, but not everyone. It is easier if you are early on – that’s why we recommend people please come in early. It’s easier, of course, if you’re compliant and stick to your program. It’s easier if you have subtype 1 (inflammatory), 1.5 (glycotoxic), or 2 (hormone deficiency/atrophic). It’s harder if you have subtype 3 (toxic) and if you have specific toxins because you’ve actually got to identify those and then get rid of those. There are different things that make it harder or easier, but for many people, and typically for most people, if you do the right things, over time you will show improvement. Once a patient is on their program, they should see some level of improvement within three to six months usually. If they don’t, it’s one of two things: either, number one, they’re really not following their program 100 percent, or number two, we just have to dig deeper and find out what else is there that’s blocking the progress that we need to find and treat. Thank you for listening! If you enjoyed this podcast, please subscribe and leave a 5 star rating and review on iTunes! TAKE YOUR LIFE BACK WITH THESE 5 SIMPLE STEPS. 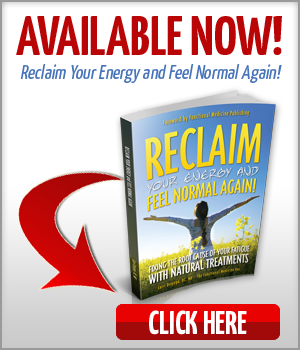 ﻿﻿﻿﻿Download our free ebook "5 Steps to Feel Normal Again in 30 Days" now!